Tammy always brings not just superior knowledge but her enthusiasm to teach EVERYONE is contagious! Her boundless energy keeps the coaches and the gymnasts wanting more and we were all sad to say goodbye at the end of camp week. 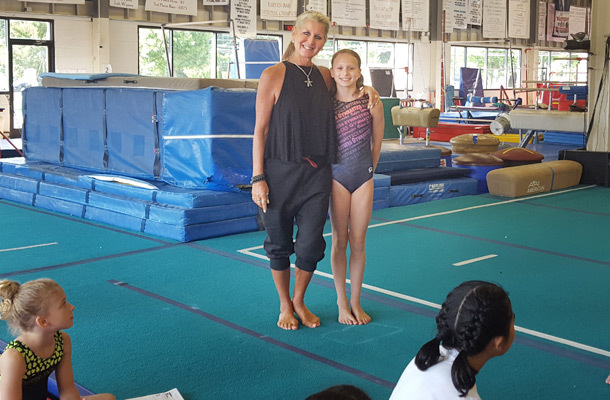 All the coaches and gymnasts are taking what Tammy taught and implementing everything into the fall training schedule so that all our gymnasts can learn something new. We would also like to congratulate Camryn Nelson for being selected as Camper of the Week by Tammy & the Will-Moor staff. We have posted some photos from the last day of camp – Friday Funday. You can find those images and videos over on Will-Moor’s Flickr page by clicking HERE.